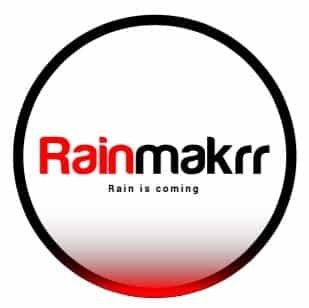 There’s been a huge surge of interest amongst startups to use some form of the Objectives and Key Results, or OKR, methodology as invented by Intel, made popular by John Doerr and recently spearheaded by Google. So why isn’t the objectives and key results approach integrated with a startup’s investment pitch? About a week ago I forwarded a link to an article about objectives and key results to my developer partner to show how it validated the time we’d spent developing our own objectives and key results blend. As I mulled over a post-release beer and made a note to myself to create a Business Model Canvas as originally created by Alexander Osterwalder or the later, excellent Lean Canvasadaptation by Ash Maurya, which is hugely popular amongst startups and investors for providing a quick 1-page summary of the investment opportunity. However, I started to think why aren’t OKR and the pitch canvas better integrated? I thought, why not start as you mean to go on and merge the two? If you’re a founding team pitching for money and will be using OKRs as your goal setting methodology, why isn’t OKR baked into the pre-launch and fund-raising stages? Aren’t launching a prototype and raising a ton of cash both classic Key Results under this methodology? It then dawned on me that from the other side of the table, implementing Objective and Key Results within the pitch canvas would also be highly appealing to investors. How an OKR Canvas potentially appeals to investor? Having objective and key results baked into the startup’s pitch demonstrates that the founders have unified around an operating methodology, in this case its objective and key results, and are actually applying them in practice. Brilliant! That’s a bundle of worries less for an investor and a bagful of hurdles jumped for the potential startup. Shoots, I’m on to something here, I thought…. So I started to design a more integrated approach for startups seeking funding and planning or already using this goal setting methodology called an Objective and Key Results Canvas and here’s a link to the Objective and Key Results Canvas design on Google Docs. I decided the best format was to place Objectives and Key Results at the heart of the Canvas in one of the central columns as a kind of crescendo after your problem solving, proposition and high concepts and split them into current and future quarters to show time lines. Then I thought, within this new Objective and Key Results section why don’t startups also score their key results so their investors know their status? On that note, why not also include the rated difficulty, importance and confidence in delivering these key results! It’s also very revealing about the team dynamics and their understanding of what is realistically possible. Then, looking at the rest of the template, I thought I’d make some other non-objective and key results related changes, because many of the other elements are potentially addressed in Objectives and Key Results. I decided to replace Segments with “Who do you Serve” and move to the very front of the OKR Canvas linking to “Why do we Exist”. I’ve always thought knowing who you are doing this for is simply to know you customer which is my minor bug bear with Simon Sinek’s excellent start with why? TED talk. It’s a bit like King Arthur’s final hours in the film Excalibur after his knight’s long futile search for the Holy Grail. If you can answer that question then your own Holy Grail will be a lot easier to find. Because the Objectives and Key Results can implicitly address many points I decided to add in some flexibility not normally included in a canvas. The reason for this is that times do change with, for example, many startups far less dependent on partnerships nowadays, so why not address these floating points via a catch all box? This means dependent on your category and approach, you can choose to address any or all of these elements, if needed. It just makes perfect sense to have a flexible area to give an investor a Drill Down on key points of focus. People might say this depreciates the valid sections too far but there’s still space in the Drill Down or other sections. • Get 10 Partners – they clearly get the need for partnerships • Launch Premium offer – there’s your channel development • Submit Patent X – there’s part of your defence strategy • Increase to an ARPU of $1.42 – there’s your metrics! And finally that left an open for space for mentors and members to be listed. I really like the idea of peer review and support coming into the canvas, but maybe it’s too much. Keen to hear thoughts here! So in summary, although not everyone has an agreed goal setting methodology in the early days, this goal setting methodology is definitely one I’d endorse and I’d also recommend you consider incorporating into your pitch documentation. 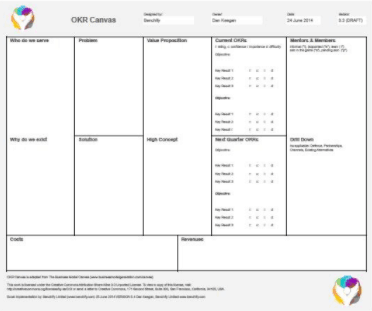 It might not suit everyone but if you are planning to launch a startup using this development methodology or if you do use them already, why not fully integrate and use the Objective and Key Results Canvas in your funding rounds? Isn’t that the whole point of key results! Who would not be impressed by that? Go for it, I say! I’m certainly going to give it a shot. I’ll let you know how it goes! And is licensed under the Creative Commons Attribution-Share Alike 3.0 Un-ported License.